Home > Can't Keep Your Cat In? Outdoor cat enclosures are the perfect way to give your cat the benefits of the outdoors without compromising their safety and the safety of other animals. The possibilities are endless for the type of enclosure you can have; there are a number of companies that offer custom enclosures designed to fit your dwelling and suit your cat’s needs. Habitat Haven is a great Canadian company that sells pre-made and custom built enclosures for cats that can be installed almost anywhere, even in apartment buildings. Check out feedback from Habitat Haven’s customers on their experience with using outdoor enclosures. Pet stores sell harnesses and leashes made specifically for cats. Some cat owners will put their cats on a harness and leash in the backyard so their pet can play alongside them when they are outside. Others will use the leash to take their cats for walks through the neighbourhood. Although the sight of a cat on a leash may seem strange to some, it is a common practice and not difficult for most cats to get used to, as long as the owner has the patience and attentiveness to help their cat adjust to this routine. There are many online resources with helpful tips on harness training your cat, such as this one from the OSPCA. Every cat is different. Some cats take off like a lightning bolt the moment they step one paw outside, while others show no apparent inclination to go further than the front porch. We would not recommend that even the most laid back cats be left unattended outside, as they may be tempted to chase an animal running by, be attacked by an animal or person, or spooked from their safe spot to a more dangerous one. However, if you are confident that your cat has this kind of relaxed nature and you are comfortable doing so, you may be able to take the cat outside with you to sit on your lap in the sun, or let the cat walk around an enclosed yard under supervision. We believe that almost all cats (with the possible exception of some feral cats) can adjust, with time and patience, to living happily indoors or in protected outdoor enclosures. If you feel, however, that this is not an option for your cat, please consider at least keeping your cat indoors during the warmer months, particularly between April-August. Hundreds of wild animals are raising their young in your neighbourhood during this time, and wild babies are completely defenceless against cats on the prowl. Many people are unaware, for example, that most baby birds spend 1-2 weeks hopping around on the ground after they have left their nest, BEFORE they are able to fly. This is a part of their normal “fledgling” period, and though parent birds are still feeding and caring for their babies during this stage, they cannot protect them from cats. Many mammal species also nest on the ground or in places cats can easily access. Cottontail rabbits stash their babies in a ground nest (which are frequently built in urban and suburban backyards) and for 3 weeks will leave them unattended except when feeding them. The babies are unable to run or hop away if discovered by a cat. Wild animals are having young all through the spring and summer (many have several litters, or clutches of eggs, per season), so this is the time when cat predation does the most damage. Wild babies are also vulnerable to wild predators, of course, but the effect of cats and wild predators is different. Preying on wild babies can also leave cats vulnerable to attacks by defensive wild mothers. 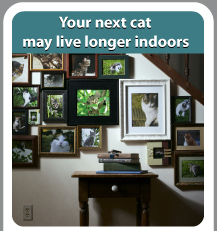 Please keep your cat inside during the spring and summer months.